Buying a top-rated surfboard for intermediate surfers can be quite challenging with so many surfboard brands, varieties, and types to choose from. In this article, we will review one of the best surfboards for intermediate surfers in the market today – the Wavestorm 8” Classic Longboard. Here is a quick recap on what we think of this surfboard. Who Is Wavestorm 8" Surfboard For? The Wavestorm 8” Classic Longboard is recommended for intermediate surfers. It is designed to help the user learn to surf fast and easy. You may stumble into the water several times, and because of this, it has a protective feature to ensure your surfboard will not leave you. If one of your dreams is to catch the wave and have the most significant accomplishment as you feel the ocean swell underneath your feet while you are being carried down the line, you need to go with this surfboard for maximum feel of experience and style. The Wavestorm 8” Classic Longboard is full of useful features which edge its competitors. It has two fins and an ankle leash to make your surfing experience fun and exciting. The white and blue design makes it even more appealing, and the adjustable fin box makes it more portable as compared to others of the same price range. Wavestorm 8" surfboard has a detachable bolt through thruster fin set. The fins are one of the most vital parts of a surfboard and they are available either as a permanent or a detachable one. Good fins will not just help you increase your speed while you are on the water, but they will also provide better balance and more stability. Most detachable fin systems include a tool known as a surfboard fin key. It looks like a small hex screwdriver and is used to mount and remove these fins. Travelling with removable fins is much easier. You can easily stack the boards together. This is a vital factor you need to be aware of when you are buying a surfboard. If you are too heavy for your board, it will not last long. There are boards intended for adults and children, and there are some which do not spell it out clearly. Before making a purchase, if it does not show the weight limit, it is better to ask the manufacturer to make sure the product will work for you. For Wavestorm 8" surfboard the maximum weight it can handle is up to 200 lbs. It is designed for smooth riding with its curvature and shape concentrating on gliding and stability so that you won't fall off. Another critical component of the surfboard is the leash, particularly for a new or intermediate surfer. A leash is generally a string that you can place around the ankle, so the board does not float away from you once you fall off. For starters, it is best to consider this as you will have more tumbles but if you learn how to surf, you might not need the leash. Most leashes are detachable, and they are made of different materials. Many surfboards have a spot for you to attach a leash on, so even if you purchase a surfboard that does not come with the leash, you could buy one easily if you need it. Wavestorm length is 8 feet which is long enough to spread your legs out and to surf comfortably with balance. 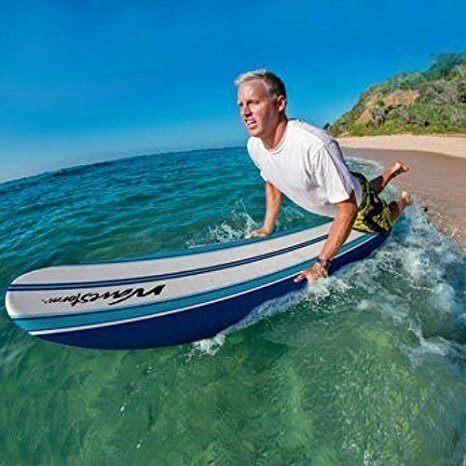 Shorter surfers can surf using this board without any difficulty. Taller surfers may be able to control longer board easily. You need to consider the deck as well when buying a surfboard. For new and intermediate surfers this feature is very important. A surfboard with smoother decks is not recommended to beginners as they might find it hard to balance on. However, a rough board can be uncomfortable if you surf for an extended period. The Wavestorm 8” surfboard has durable laminate deck that keeps the board in good shape longer and helps keep you standing firmly when a big wave hit. 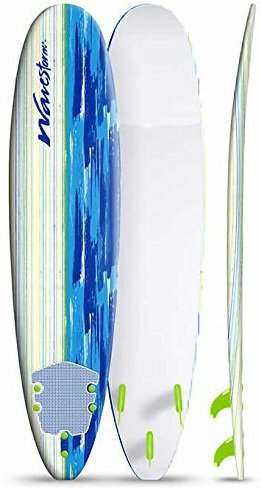 Wavestorm 8” Classic Longboard has a white and blue brushed graphic design which makes it more appealing in the water. 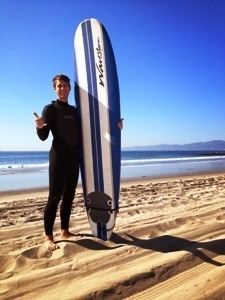 The color of the surfboard complements the ocean's color which makes the board looks like part of the water. The design is the surfer's pride and happiness. You would not want to be outcasted when surfing. What's more, you also have the option to customize your own board to match your personality. Not much surfboard companies can give you that option. When it comes to overall stability of the board, you need to focus on the board thickness. The more foam on the board, the more buoyant and stable it will be. Thickness varies and as a result, you might have an agiler or less agile surfboard. Wavestorm has an 8.3cm thickness which is thick enough to provide you better stability in the water. If you have the chance, it is best to check what kind of thickness will work well for you. Editor's Note: If you are planning to join the world of surfing, we suggest that you go with this world's leading brand of surfboards. The nose and rocker play an essential role in the overall stability and maneuverability of the board. Wavestorm surfboard has a broad nose which makes it more stable in the water. If you choose the one with the wider nose, it can affect how you maneuver the surfboard. The curve of the board or commonly known as the rocker has an important role when you are playing with the waves. The surfboard with a larger curve at the nose can deal with larger waves. The board is agiler if the board has increased tail rocker and it is easy to maneuver around. For a intermediate surfer, it is best to choose Wavestorm 8" classic longboard as it has less rocker at the center. This thing enables the board to glide smoothly on the water and easier to paddle around. When buying a surfboard, it is best to choose the one that offers a good warranty. If you are new to surfing, you are likely not that familiar with the best surfboards brands, how to look for defects. 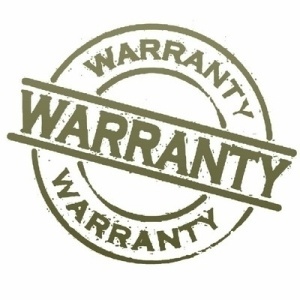 A good warranty covers everything from repair and replacement of parts. It will give you peace of mind every time you surf, and something happens on your surfboard. Wavestorm 8” surfboard warranty is not indicated on Amazon, but you can contact the manufacturer to know more about their warranty. First-time, intermediate and advanced surfers can look forward to several hours of fun surfing using this longboard. The Wavestorm 8” Classic Longboard is one of the best surfboards for intermediate surfers rated at 4.7 out of 5 stars. Despite the fact that the colors, models, and sizes might vary, keep in mind that the brand is known in the market as a company that always provide quality and durable product. So, what are you surfing....i mean, waiting for? Click below to get one right away!